Ugh. I'm so sorry. 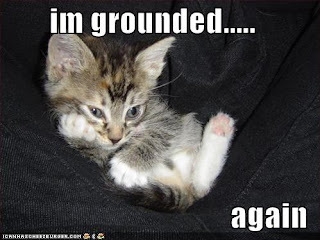 I was getting ready to do a post about grounding re: school, too. Jeff has decided to drop football. No biggie, except he waited until after we wrote the $300 check for fees to do it. He had months to make up his mind, and we even called him from the parent meeting and said, "We're writing the check right this minute. Are you sure?" Yes he was sure. Now, because he doesn't want to practice 5 days a week over summer (what did he expect after being on the team 2 years. This isn't new), he says it will infringe on his social life. Guess what? By quitting, he's going to lose his phone, his social life, his ipod, and the x-box. Bob was waaaay serious about this (I don't even have to be the hardass). He's offered to pay us back the $300, but that's not what this is about. So yeah, I understand the sucky summer. Hopefully, they'll get their act together and you won't have to worry about it. If not, this may be the perfect opportunity to start leaving TG home alone. Oh, and didn't you love how I made your post all about me? Heh.